Writing Quality Code E-Book - a book written by some of our local developer experts about .NET development. Now that Windows Vista has been launched for the regular public, there are quite a few new updates (both for Vista itself and other applications) being made available by Microsoft. Finally, we now have a version of PowerShell that works with Vista! Now I can try out all the tricks that Rob demonstrated at the January SQL meeting! I came across Simian in a post by Owen Rogers (one of the developers of CruiseControl.NET) discussing code analysis tools. It analyses code and looks for bits that are really similar (or the same). Sounds like it would be useful to identify duplicate code blocks, especially in larger projects. On Friday, I rode with my Dad (and 2,700 others!) in the Challenge Tour - a 128km ride from Stirling (in the Adelaide Hills) down to Victor Harbor. We entered the ride as part of the "Mud, Sweat and Gears" team, which are a group of cyclists from Blackwood Hills Baptist Church. Unlike last year (> 40°C), the day was cool, and quite wet. Even though we were pretty soggy at the end of the ride, I've decided I much prefer to be wet than too hot. We completed the ride in ~6 hours, which certainly wasn't record beating, but a comfortable pace for us. The only disappointing thing was that we missed out on riding under the finish arch by seconds, as they'd closed it off in preparation for the professional riders. The final version 1.0 release of "Atlas", and the January CTP of the "extra" stuff. The Version says November 2006, but I haven't seen this before. Microsoft have released the SDK for SharePoint 3.0. I received an email from Developer Express today letting me know that they've released a new version of their Refactor! Pro tool for Visual Studio. I've been using their free version since Visual Studio 2005 was released, and while it doesn't get a mention in the email or on their general product versions page, they have released a new version of the free product too. Definitely recommended for Visual Basic developers. HP have released firmware update 1.01.03 for the rw6828. I'll be interested to see if this fixed the annoying "feature" where the wireless card spontaneously turns itself on - a great way to shorten the battery life. Update: This update refuses to install via my Vista machine. I'll try it at home on the WinXP box to see if it is happier. I had a small panic until I read the readme.txt file which said if the upgrade fails, just pull the battery out and restart it - phew! Microsoft have released the January CTP of the next version of Visual Studio. I saw this sign out the front of the local video shop a few weeks ago, and last weekend remembered to take a photo of it!. 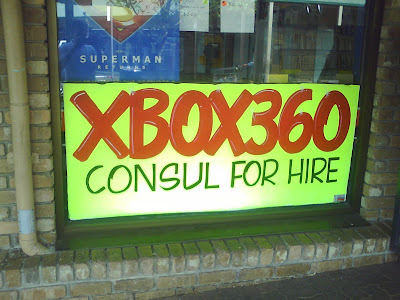 It's a bit surprising, as I would have thought you would pick 'console' before 'consul' as the more well-known/spelled word. I suppose they do have those 'alternate world' games to which you might want to have diplomatic relations! I'm back at work after two weeks leave over the Christmas/New Year's break. Not too many emails to sort through, and not too many problems to fix so far. One nice thing was that Michael from ISTS (our IT Unit) got hold of the latest build of Symantec AntiVirus which finally supports Vista 64bit. It's been the one big uncertainty about running Vista 64-bit - having to tread very carefully for the last month or two without that extra safety net. I also got access to the RTM of Office 2007 Enterprise Edition just before I went on leave, so it's nice to be running the release version of Office 2007 now.